Avolusion Portable Storage System (HD250U3-Z1) 1TB Ultra Slim 2.5" SuperSpeed USB 3.0 Portable External XBOX One Hard Drive (Black) is designed to attract the eyes of user at a glance with durable chassis external hard drive. 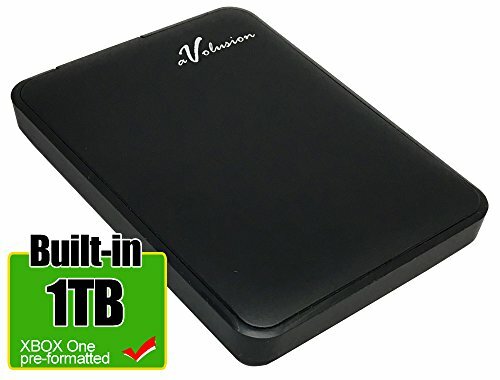 The Avolusion HD250U3-Z1 1TB Hard Drive endeavors top quality design in durable case, with slim trimming, which make the Avolusion HD250U3-Z1 1TB 2.5" USB 3.0 External XBOX One Hard Drive a fine piece of storage device on your palm. You can connect these to your XBOX One Game Console USB 3.0 port to expand your XBOX One storage capacity instantly! It is fully compatible with XBOX One, XBOX One S Game Console. (XBOX One Pre-Formatted). SuperSpeed USB 3.0 Transfer Rate up to 5.0 gbps extreme fast performance!